Any day in New York City is hectic, but it’s hard to rival the multi-national bustle that is UNGA. UNGA – or the United Nations General Assembly – transforms the city’s Midtown East into a flurry of Secret Service vehicles, police barricades, celebrity-occupied limos and government affiliates from around the globe. The Assembly meets from September to December annually, but the first week is especially eventful as Heads of State and other High Representatives from 193 UN Member States come together for a General Debate on pressing global challenges. on Refugees Filippo Grandi to speak in the UN General Assembly Hall. This year’s festivities kicked-off last Monday, September 19th, with the first-ever UNGA Summit on Addressing Large Movements of Refugees and Migrants. 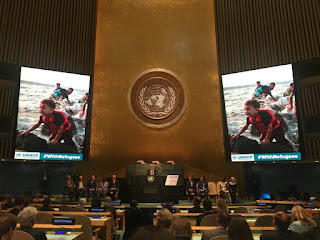 This is the only time in the UN’s 71-year history that the General Assembly has called on Heads of State, UN system leadership, civil society, the private sector, international organizations, and academia to come together to strengthen international protections for migrants and refugees. 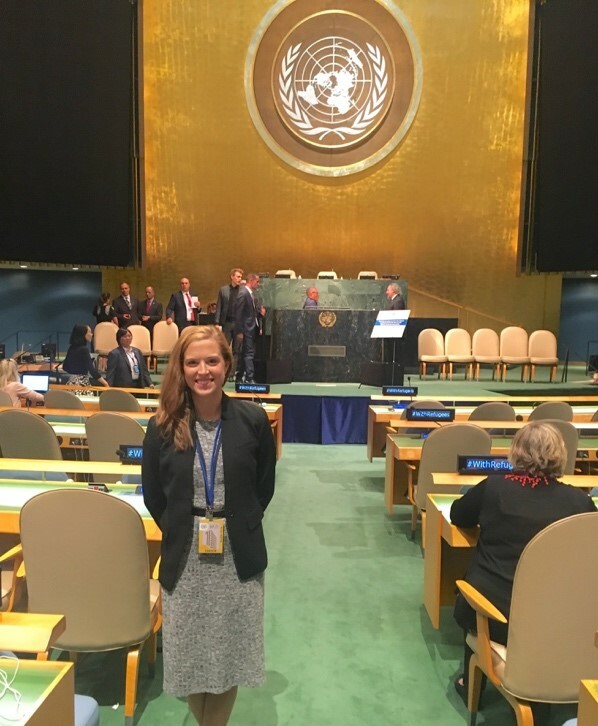 As a summer fellow with UN High Commissioner for Refugees (UNHCR) – an opportunity supported by the Harvard Kennedy School’s Women and Public Policy Program – I dedicated my time to planning both the content and logistics of the Summit, and I was lucky enough to return to New York for the big day. Declaration also clarifies the importance of intergovernmental “responsibility sharing” to relieve pressure on the small group of fragile frontline countries that currently shoulder a disproportionate share of refugee crisis costs. In adopting the Declaration, Member States reaffirmed the importance of adhering to the relevant international laws, such as the 1951 Refugee Convention. 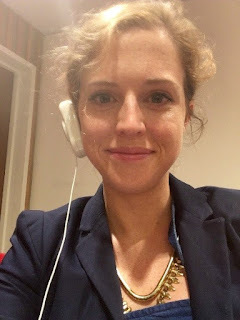 discussions this summer via UN translation headset. From Syria, to Uganda, to Pakistan to the US, the growing global phenomenon of large movements of refugees and migrants has reached unprecedented proportions. In 2015, the number of migrants surpassed 244 million, growing at a rate faster than the world’s population. A 2015 UNHCR report indicates that there are 21.5 million refugees, 3.2 million asylum seekers, and 40 million internally displaced persons (IDPs) – a total of over 65 million forcibly displaced across the globe. This is the highest amount since UNHCR began keeping record in the 1950s. One lesser-known fact is that forced migration disproportionately affects women and girls, because of hardships like a lack of access to health services, limited educational opportunities, and rampant sexual and gender-based violence. Over 60 percent of preventable maternal mortality deaths take place in settings of conflict, displacement and natural disasters. Reviews of the New York Declaration and its Global Compacts have been mixed. Critics point out that the document contains no concrete commitments and is not legally binding. Moreover, the Declaration drew ire from many advocacy organizations when UN Member States removed the original draft’s pledge to resettle 10 percent of the world’s refugees per year during negotiations. Philippe Bolopion of Human Rights Watch explained, “We're facing an historic crisis and the response is not historic." High Commissioner Grandi addresses the General Assembly Hall. Although the Declaration prescribes that the Global Compacts incorporate “a gender perspective” and “promote gender equality and the empowerment,” UN funding to gender-specific projects is historically lacking. Only 4 percent of UN projects in 2014 specifically targeted women and girls, and less than 1 percent of all funding to fragile states went to women’s groups or women’s ministries between 2012 and 2013. As the General Assembly and UNHCR develop the Global Compacts over the next two years, leadership and participation of migrant and refugee women will be essential to address and meet gender-specific needs. UN leaders like Secretary General Ban Ki-moon and UN High Commissioner Filippo Grandi disagree with the critics. The Secretary General – a refugee himself during the Korean War – declared on Monday that “Today’s summit represents a breakthrough in our collective efforts to address the challenges of human mobility.” High Commissioner Grandi praised the Declaration for expanding the concept of an international refugee response, because now Member States unanimously agree that traditional humanitarian aid is inadequate. The High Commissioner also said that States’ reaffirming existing international law will give UNHCR more leverage in holding Members accountable for their obligations to refugees and migrants. As I took the train back to Cambridge on Tuesday night, I thought about something UN High Commissioner for Human Rights Zeid Ra’ad Al Hussein said on Monday: “The bitter truth is, this Summit was called because we have been largely failing.” More people are forced to flee their homes than at any time since World War II, and the only answer to this global problem is to harness the political will of the international community. This Summit and the accompanying New York Declaration did just that – it created a blueprint for world leaders to build a more robust protection structure for refugees and migrants. It was a breathtaking and historic moment to watch. Now that the framework is in place, it’s time for UNHCR and UN Member States to translate that vision into action.